When you're trying to lose weight, slow and steady wins the race. 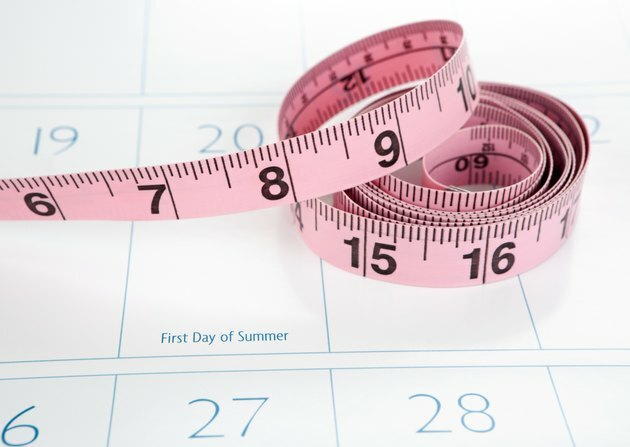 Losing weight at a gradual, sustained rate increases the long-term success of keeping it off, so plan on a healthy weight loss of 1 to 2 pounds per week. Make the right changes and stay diligent, and you can expect to lose 30 pounds in 3.75 to 7.5 months. A number of factors influence weight loss rate, such as gender, age and baseline activity level, so you may reach your target before or after this estimated time frame. A wide number of weight loss strategies are available, but it all comes down to burning more calories than you're taking in. Consult your doctor or dietitian before starting a weight loss plan and for help in individualizing a plan to meet your needs. To lose 30 pounds in four to seven months, you must create a calorie deficit of 500 to 1,000 calories per day. A tried-and-true way is to reduce your daily intake by 500 calories and add moderate-intensity exercise on most days. The American College of Sports Medicine recommends more than 250 minutes per week when you have significant weight to lose, as well as two to three sessions of strength training each week to increase lean mass. The calorie deficit created through a combination of a reduced-calorie diet and exercise allows you to lose your target weight in four to seven months. To find out your baseline daily calorie needs, use an online calculator where you plug in your current weight, age, gender and activity level. Then subtract 500 from your baseline calorie needs, and you'll have your target calorie intake for losing weight. Be sure not to go below 1,200 calories if you're a woman, and 1,600 calories, if you're a man. Dropping below those daily calorie levels may mean you're missing essential nutrients and could decrease your metabolism, stalling weight loss. Make healthy food choices to remain within your target calorie range and improve your health. Vegetables and fruits are packed with nutrients and naturally low in calories, so stock up on these staples. Whole grains such as oats, whole-wheat bread, brown rice, quinoa, barley and whole-grain pasta are rich in fiber, which helps keep you full. Replace processed meats such as sausage with lean options like chicken and turkey breast and lean cuts of beef such as sirloin. Swap out solid fats for unsaturated oils like those found in oily fish like salmon and mackerel. Other good sources of unsaturated fats are plant oils like olive, flax seed and sesame. Cut back on empty calories, which have no nutritive value. They come from added sugars and solid fats found in processed foods. In the American diet, sugar-sweetened drinks, cake, cookies, pizza and ice cream are some of the major sources of empty calories. Controlling your portion sizes plays a role in weight management. An easy way to remember portion proper portion sizes is to use the MyPlate method. Divide a regular-sized plate into four equal parts and fill each section with vegetables, whole grains, fruit and protein. Remember the saying that when you fail to plan, you plan to fail. Planning your targeted weight loss journey raises the chances that you'll stick to it and successfully reach your goal. You'll need a monthly planner and a meal planner. Notebooks are good for this purpose, and you have the option of digital planners online and on your smartphone. Use a monthly planner to plot out each week along your four- to seven-month weight loss journey. Prepare to plan your meals at the beginning of each week and put them in a meal planner to take the guesswork out and keeps you on track along the way. You can even make grocery lists from your meal plan to make a shopping list. Spread your meals out through the day to avoid feeling hungry. Having three main meals and three nutritious snacks means you'll eat roughly every three hours if you normally get up at 8 a.m. and go to bed at 10:30 p.m. Implement a splurge day each week to keep from feeling deprived of your favorite foods. Portion control is still a factor, so have a 100-calorie pack of cookies, instead of several regular high-calorie cookies, for example. Or, have one slice of thin-crust cheese pizza while you're watching the game, instead of several regular slices of deep-dish pizza with the works. Keeping a food journal is one of the best tools for losing 30 pounds in four to seven months. It's an effective strategy to self-monitor your diet, helps you track your progress, gives you insight into what and when you're eating, and holds you accountable for your food choices. If you hit a snag where the scale seemingly won't budge, your food diary provides an excellent reference to tell you where you need to make some changes. Recording in a food diary may significantly increase your weight loss success, according to a study coordinated by four top research centers, including Kaiser Permanente and Johns Hopkins University. Of the more than 1,600 participants, those who kept food journals lost twice as much weight as dieters with no records, according to the results published in the American Journal of Preventative Medicine in August 2008.